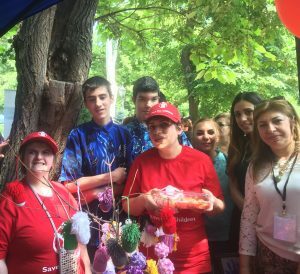 On June 1, celebrating the Children’s Day, the Aleppo Compatriotic Charitable Organization’s “Arevik-Armenia” Center for mentally and physically disabled Syrian children and adults participated in “Voice of the Children” event organized by “Save the Children” international organization’s Armenia office. 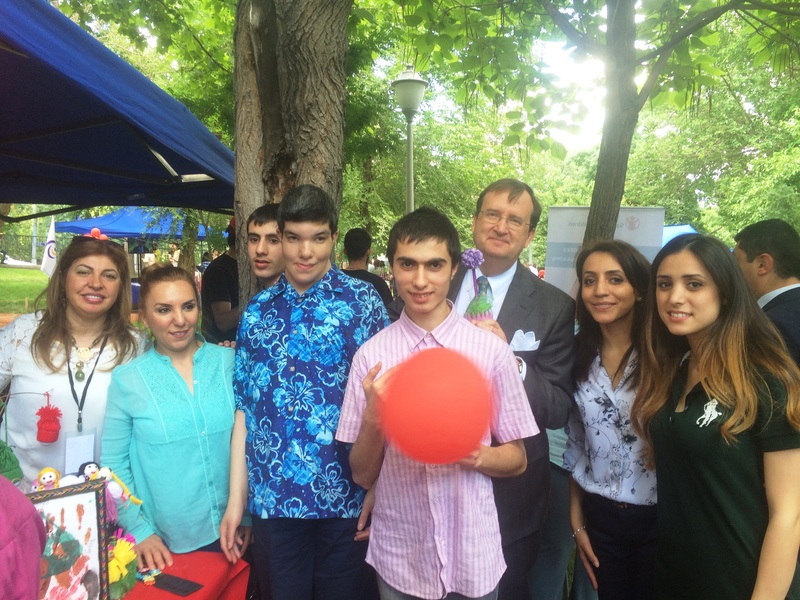 Embraced by child sincerity and laughter, the event was a unique festivity for all participants – full of interesting games and colorful gifts. In a separate pavilion, assisted by their teachers and representatives of Aleppo CCO, the pupils of “Arevik-Armenia” center presented diligently crafted original handmade works to the public. Visitors of the “Arevik-Armenia” center’s pavilion also had a chance to taste a variety of sweets and receive beautiful gifts. 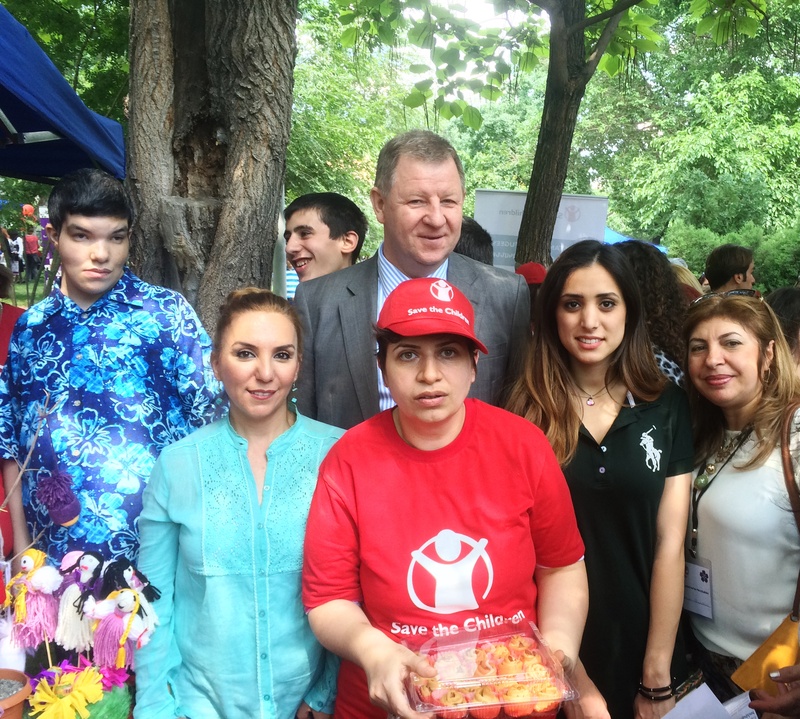 A large number of children, parents as well as representatives of local and international organizations visited the pavilion of “Arevik-Armenia” center. 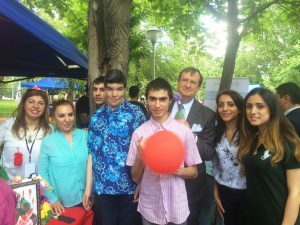 Among them were the U.S. 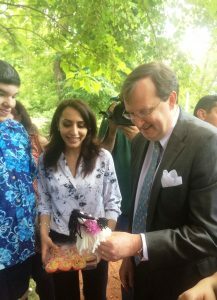 Ambassador to Armenia, Mr. Richard M. Mills, Jr., and the Ambassador Extraordinary and Plenipotentiary of Lithuania to Armenia, Mr. Erikas Petrikas, who honored the center’s pavilion with their visit and paid a special attention to “Arevik-Armenia” center’s activities. Aleppo CCO expressed its appreciaton and highliged the importance of “Save the Children” international organization’s Armenia office’s activities, support and care for Syrian children who found shelter in Armenia. During the event, as a sign of gratitude for “Save the Children” orginization’s special attention to Aleppo CCO’s “Arevik-Armenia” Center for mentally and physically disabled Syrian children and adults, the head of the international organization’s Armenia office, Arsen Stepanyan, was gifted with a picture symbolizing unity, painted “Arevik-Armenia” center’s pupils. 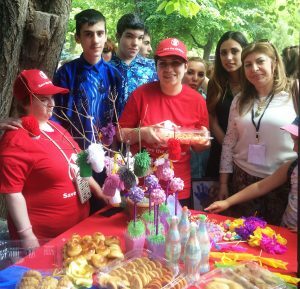 The “Voice of the Children” event became a memorable holiday that brought new colors into everyday life of the pupils of “Arevik-Armenia” Center for mentally and physically disabled Syrian children and adults.